A typical mammalian gene is composed of several relatively short exons that are interrupted by much longer introns. To generate correct mature mRNAs, the exons must be identified and joined together precisely and efficiently, in a process that requires the coordinated action of five small nuclear (sn)RNAs (U1, U2, U4, U5 and U6) and more than 60 polypeptides. The inaccurate recognition of exon/intron boundaries or the failure to remove an intron generates aberrant mRNAs that are either unstable or code for defective or deleterious protein isoforms. Paradoxically, in higher eukaryotes, the requirement for accurate splicing is met by exon-intron junctions that are defined by weakly conserved intronic cis-elements: the 5' splice site, 3' splice site and branch site. These elements are necessary but by no means sufficient to define exon/intron boundaries. Exonic enhancers are thought to serve as binding sites for specific serine/arginine-rich (SR) proteins, a family of structurally related and highly conserved splicing factors characterized by one or two RNA-recognition motifs (RRM) and by a distinctive C-terminal domain highly enriched in RS dipeptides (the RS domain). The RRMs mediate sequence-specific binding to the RNA, and so determine substrate specificity, whereas the RS domain appears to be involved mainly in protein-protein interactions. SR proteins bound to ESEs can promote exon definition by directly recruiting the splicing machinery through their RS domain and/or by antagonizing the action of nearby silencer elements. Models of SR protein action in exonic-splicing-enhancer-dependent splicing a)RS-domain-dependent mechanism. An SR protein binds to an ESE through its RRMs and contacts the splicing factor U2AF35 and/or the snRNP protein U1-70K at the adjacent splice sites through its RS domain. The large subunit of U2AF (U2AF65) binds to the polypyrimidine (Y) tract, which here is interrupted by purines (R) and is therefore part of a weak 3' splice site. U2AF65 also promotes binding of U2 snRNP to the branch site. U2AF35 recognizes the 3' splice-site AG dinucleotide. The U1 snRNP particle binds to the upstream and downstream 5' splice sites through base paring of the U1 snRNA; the 70K polypeptide of each U1 snRNP particle is shown. The three sets of splicing-factor:pre-mRNA interactions (U2AF:3' splice site, U1 snRNP:5' splice site and SR protein:ESE) are strengthened by the protein:protein interactions (blue arrows) that are mediated by the RS domain. For some ESE-dependent pre-mRNAs, indirect interactions (black arrows) are bridged by the splicing co-activator Srm160, which stimulates splicing of some ESE-dependent pre-mRNAs and also interacts with the U2 snRNP. b) RS-domain-independent mechanism. Here, the main function of the SR protein that is bound to an ESE is to antagonize the negative effect on splicing of an inhibitory protein that is bound to a juxtaposed exonic splicing silencer (ESS). 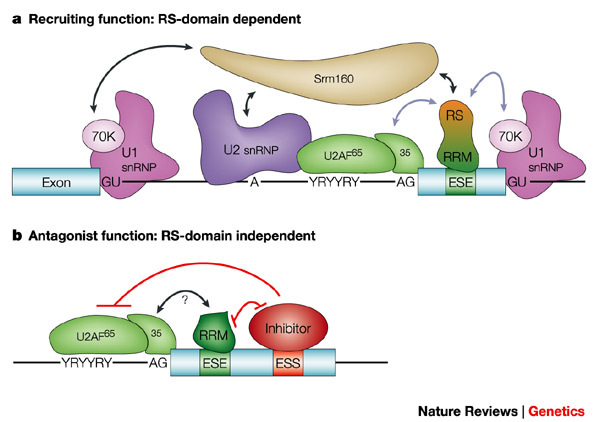 The SR protein is shown without its RS domain, although this domain is normally present and might still promote U2AF binding, or other domains might be involved in protein:protein interactions. Inhibitory interactions are shown (red), as is a putative stimulatory interaction (double-headed arrow). These models are not mutually exclusive, and the splicing of some introns might involve a combination of these mechanisms. Cartegni L., Chew S.L., & Krainer A.R. Listening to silence and understanding nonsense: exonic mutations that affect splicing. Nat Rev Genet. 2002 3(4),285-98. Caceres JF, Kornblihtt AR. Alternative splicing: multiple control mechanisms and involvement in human disease.Trends Genet. 18(4), 186-93. (2002). Hastings, M.L. & Krainer, A.R. Pre-mRNA splicing in the new millennium. Curr Opin Cell Biol 13, 302-9. (2001). Graveley, B.R. Alternative splicing: increasing diversity in the proteomic world. Trends Genet 17, 100-7. (2001). Blencowe, B.J. Exonic splicing enhancers: mechanism of action, diversity and role in human genetic diseases. Trends Biochem Sci 25, 106-10. (2000). Graveley, B.R. Sorting out the complexity of SR protein functions. Rna 6, 1197-211. (2000).